Myerchin's patented double-lock system allows this unusual and practical folding rigging knife to be used with both blade and marlinspike locked in full open position. A number of other features of this heavy eight-ounce folder were designed with the sailor in mind but serve well for anyone who works regularly with rope and heavy straps. For cold days and heavy weather, the B300's lanyard clip will certainly be handy. Tie the knife to your belt and if it slips from your numb fingers, you'll still have it. Although it does look large and cumbersome, if you've tied a few knots when you were so cold you couldn't move your thumbs, you'll see this over-sized folder as a good thing. The long eye of the drop point blade is easy to find in the dark and doesn't require much finesse to grab. This fine edged blade doesn't have the coarse cutting power of the Myerchin serrated knives, but the 440C high carbon stainless steel holds an edge well. Keep it razor sharp, and it's enough. One reason Myerchin chose this particular steel and this blade type is that it's easy to maintain even if you work around corrosive saltwater. Heavy polished stainless steel end bolsters give the knife extra strength, which it certainly needs to stand up to the twisting and levering of a marlinspike working a stubborn knot loose. The knife's grip of riveted black micarta laid over stainless steel liners won't be affected by either weather or chemicals. 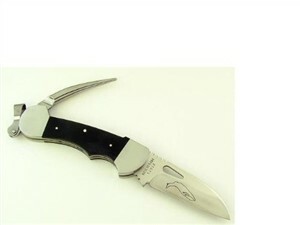 Shape of the grip keeps the knife in hand and includes a forward finger choil, plus jimping on the spine of the knife blade to provide a firm seat for the thumb. The Myerchin B300 folding rigging knife comes with a cordura nylon belt pouch. The flap of the sheath seals the knife in its holster with Velcro and keeps the knife in place in any position. This serial-numbered knife carries a limited lifetime warranty.